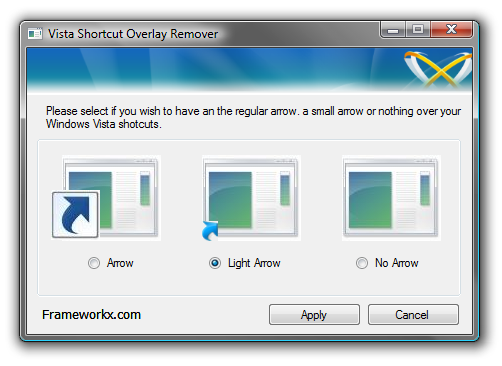 Vista မှာ shortcut arrow လေးတွေဖြောက်ချင်လို့ပါ????? "This installation package is not supported by this processor type. Contact your product vendor."ဆိုပြီးပေါ်နေတယ်.. Use "Tune Up Utilities 2008 software"
Note: noarrow.ico must refer to the name of the file that you add to the %systemroot% folder. In other words, download noarrow.ico, extract the file and copy it to the \Windows folder. There are two methods, one for Vista and one for XP. Do you find the Shell Icons have value in HKCU** or HKLM? Is 29 a String Value or a DWORD? Answer: Logoff then log back on. Noarrow.ico is a special blank, transparent ico file. Regedit requires the double backslash before filenames, \\ sytem32 is correct. What happens is that Regedit automatically strips out one of the backslashes.